Exactly one year ago I reached out to Professor Dorigo Marco after reading about his research in The Economist in an article titled Artificial intelligence: Riders on the swarm. Marco is a researcher at the Free University of Brussels and is one of the founders of a field that has become known as “swarm intelligence”. Dr. Dorigo is now working on something that can act as well as think: robots. A swarm of small, cheap robots can achieve through co-operation the same results as individual big, expensive robots—and with more flexibility and robustness; if one robot goes down, the swarm keeps going. 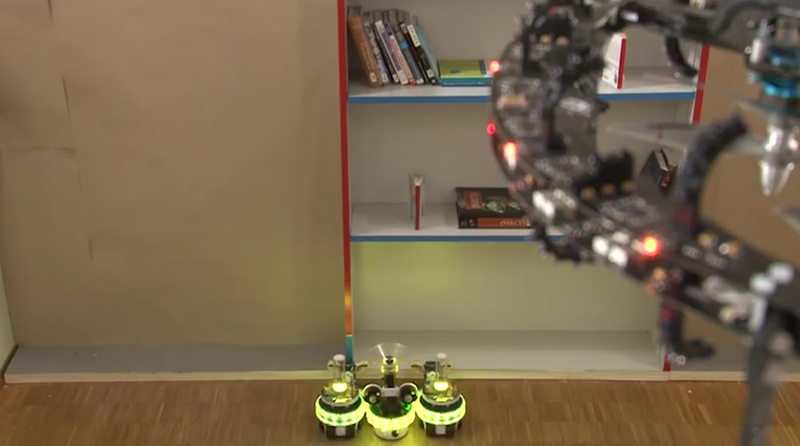 His winning project, “Swarmanoid” is a heterogeneous robot swarm with eye-bots, hand-bots, and foot-bots, which specialize in manipulating objects and climbing, moving on the ground and transporting objects, and flying and observing the environment from above. This video below presents the Swarmanoid project, a 4 year research project coordinated by Marco Dorigo and funded by the Commission of the European Union. In it you’ll watch a small army of flying, climbing and rolling robots who’ve been taught to work together to find and “rescue” a book from a high shelf. But this is a reminder that it’s not about the task of fetching a book, it’s about the technology involved getting robots to solve a problem together. Imagine millions of robots working together, or nanobots that could morph into any shape to solve a problem. It’s collaborative production, crowdsourced intelligence and hive mind at its digital finest.